When The Great British Bake Off final aired in October, nine million viewers watched from the edge of their seats as the three finalists completed challenges in picnic pies, pretzels and wedding cakes. Among local viewers was fellow contestant, Deborah Manger, who was among the original competitors selected to participate in the fourth series, and who, for months, had to remain strictly mum about the winner. The show is hugely popular, attracting more viewers than even ITV’s X-Factor. The competition selects the best cook from a baker’s dozen of 13 hopefuls, with three weekly tasks on which they are judged: a signature bake, a technical challenge and a show-stopper bake. 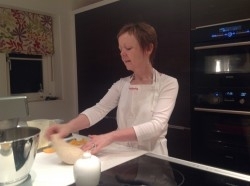 Deborah, who lives near Oundle, became interested in baking at the age of 11, when she began learning home economics, a subject she continued up to A Level. She now works as a Clinical Director and Specialist in Special Care Dentistry. Her motivation to enter the competition was inspired by her “approach to life that is reminiscent of a bucket list”, trigged by her family’s experience of significant ill health across the generations. To make the selection cut, Deborah managed to beat off over 10,000 applicants. She tells me that she practiced recipes all week after work, and had to undergo a lengthy four month audition process. This included several interviews, a written application, a meeting with the home economists, and a preliminary bake off adjudicated by Paul Hollywood and Mary Berry. Deborah says that although the show was competitive, the camaraderie was wonderful and she found it a very supportive process. “The Bake Off is a process where you literally feel you have put your heart and soul on a plate and when it does not go well, or you are criticised, it feels personal. As we all felt that way we knew we had to support each other when a baker was struggling,” she said. The emotions provoked by the show came as a surprise to Deborah, and it was a response she could not have imagined, as she “manages her emotions well” within her professional work life, which can itself be difficult. She thinks the emotions caused by the programme are due to several factors. Firstly, cooking and baking is “a very personal expression so when it goes wrong you feel badly”. There is also the fatigue caused by filming on set for a minimum of fourteen hours a day at weekends, and for Deborah this meant not being able to rest all week, as she was also working full time during the week. “Couple that with being away from home, and …you have tears”. Some of Deborah’s most memorable moments on the show included the incident where she unwittingly stole fellow competitor Howard’s custard, a catastrophe she was “distraught” about, and which she had trouble living down when Twitter erupted into jokes about the “custard caper”. I had always wondered what happened to the leftover cakes made by the contestants, and Deborah shed light on this: it is shared between everyone during lunch and tea breaks! According to Deborah’s husband, her greatest baking strength lies in pies, both sweet and savoury. As a local baking hero, Deborah offers some tips on where to source equipment: she recommends Stu Pots and the Northamptonshire cook shop Abraxas. For sourcing the right ingredients she uses local shops wherever possible, but often uses the internet, for example when buying edible flowers. interesting, as she does not view herself as brave. If you don’t come across Deborah on the streets of Oundle, you can visit her blog for some of her baking inspiration: www.deborahmanger.wordpress.com.